When Shihan Kreh decided to create a permanent dojo space for his studens, it barely resembled the space it would later become. As time passes, Shihan Kreh continues to work on the dojo. It is, like Karate itself, an ever evolving process, a work in progress that continues to improve with time. 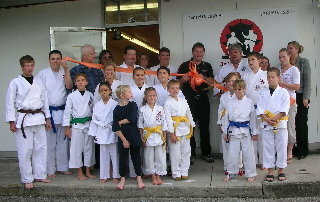 First belt promotion at the new dojo 9/18/2007. Since its inception, Jicho`oshin Dojo has promoted its share of students to the rank of black belt. Will you be one of them? Grand Opening day demonstration. The students perform 5 step sparring. 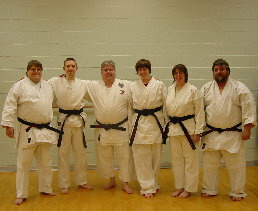 Jim Ehrman (left), promoted to 1st degree 2/9/2007, Ryan Lorek (2nd from left), promoted to 1st degree 2/9/2007, Shihan Kreh, Alex Spangler (3rd from right), promoted to black belt 2/9/2007, Kami Harman (2nd from right), promoted to black belt 2/9/2007, Steve Spangler (right). Shihan Kreh closed the dojo in the fall of 2015. He continues to offer instruction on a private basis. Please Contact Shihan Kreh for more information.